Adding an addition to your home is a huge decision. A deck, patio, or a screen room can make a home even better than before. 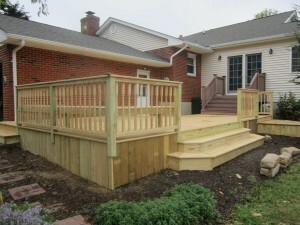 If you are looking for an environmentally friendly polymer stabilizing wood or custom stamped concrete and vinyl decking then First State Contractors will be the right deck building in Bear, DE for you! They can create a unique design and stay within your budget, while providing the best quality. They offer the advanced preservative in Ecolife decks, which helps to protect against termites and decay. They can even be painted and stained and come with a lifetime warranty. If you are trying to expand your living space then a screened in porch may be a great option. During the construction of a screen room First State Contractors can provide you with accurate CAD renderings of the project. All necessary permits will be obtained and they are licensed. Contact us today or call 866-398-9103 to get started.